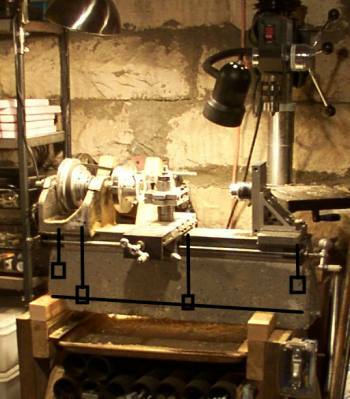 I went and got rid of the feet and bolted my lathe directly to a 24x10x10 trapezoid of concrete. I cast it in a plywood form with the lathe bolted into it, then smeared bondo on the top to bed in the lathe even better. It still comes apart easily for transportation. This is one of the better modifications I've done. Takes away most of the tool-shattering chatter that ruined much of my early work on this lathe. The bed is bolted down in four spots. The second bolt from the left tightens the headstock down to the bed and pulls the pedestal up to the bed. The bolts screw into a system of 3/8-16 threaded rods (black lines) and tees (squares) embedded in the concrete and post-tensioned. You can see the tensioning nuts sticking out of the right side of the pedestal. The pedestal sits on four felt pads and is held down by four felt pads wedged at an angle with wooden blocks. The front of the pedestal has 5 degrees drag just like the bed, the back is more like 60 degrees. The felt pads absorb vibration transmitted from the motor through the wooden stand, and isolate the pedestal from the rest of the structure. The only vibration getting into the lathe comes from irregularities in the belt and step pulleys. This slide-out chip tray is also a commercial baking sheet. Works great. 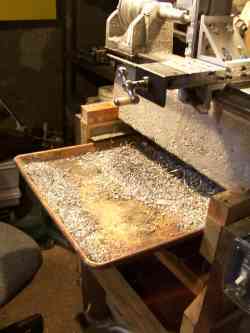 All the chips and oil that don't settle on the lathe itself fall into this tray. Also take a look at the concrete machine construction page. Based on "PukiWiki" 1.3 by yu-ji. Powered by PHP 5.3.2-1ubuntu4.5. HTML convert time: 0.067 sec.